By all accounts, Office 365 is a huge success for Microsoft and its customers. In the quarter that ended June 30, 2015, Microsoft’s commercial cloud revenue grew 88% to an annual run rate of over $8 billion. Skyhigh analyzed the cloud usage of our 21 million users, across over 600 enterprises that use Skyhigh CASB, and found that an impressive 87.3% of organizations have at least 100 active Office 365 users. 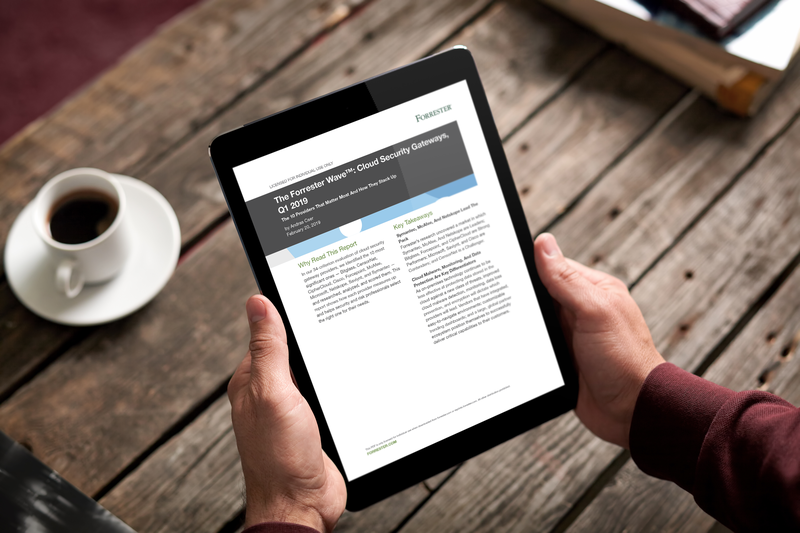 When asked to identify the benefits of Office 365, IT leaders frequently mention its cost advantages and ability to improve the productivity of an increasingly mobile workforce. 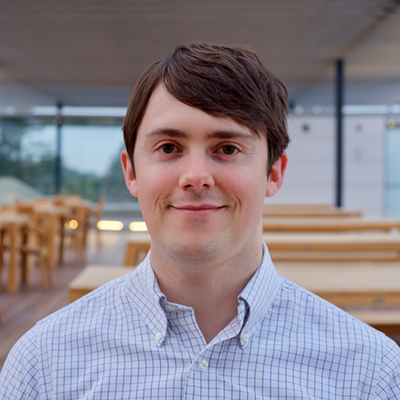 Skyhigh’s own analysis of how enterprises use Office 365 has uncovered several additional benefits and a few areas of caution. With the release of Windows 10, we thought this was the perfect time to take a look at how Office 365 is changing how companies work. Windows 10 will offer deeper integration with OneDrive and the new Universal Office apps for Windows 10 (the new version of Office that supports desktop, tablet, and mobile devices), will require an Office 365 subscription. We expect that this requirement will lead many companies to accelerate their Office 365 migrations. Today, as you’ll see below, most Office 365 customers have taken a staged approach to migration. Most of them are running a hybrid of on-premise versions of Microsoft applications for most employees, while they migrate users to the cloud versions incrementally. 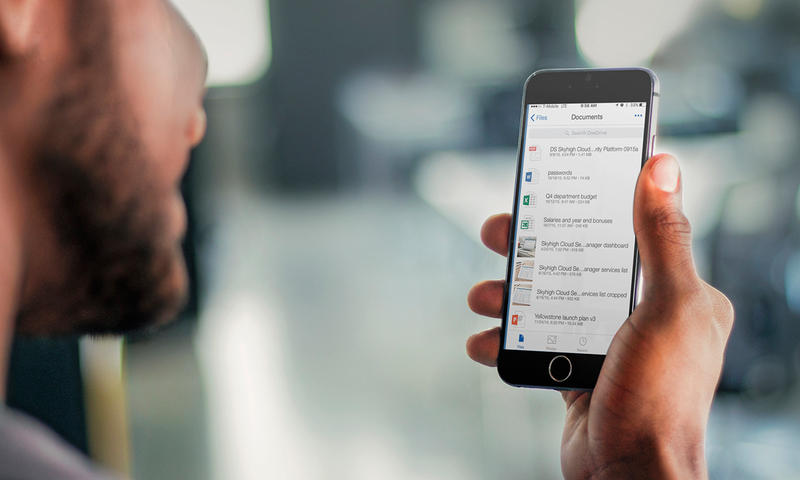 SharePoint Online and OneDrive are not just platforms for employees to collaborate with each other; they also facilitate collaboration between companies. 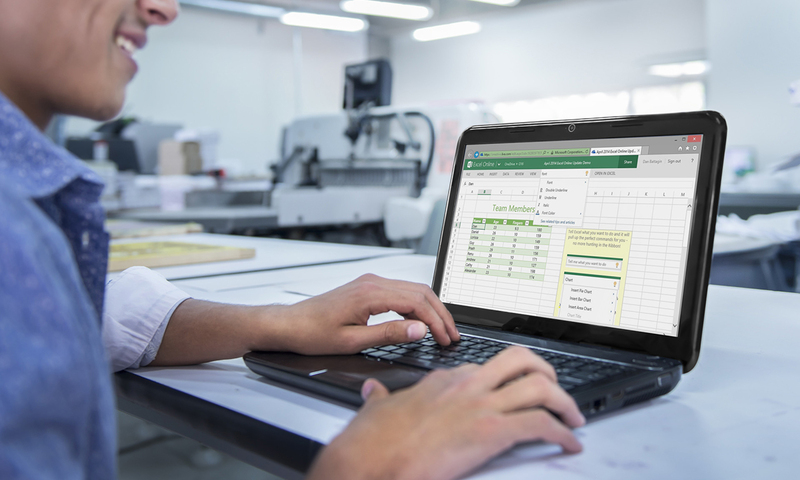 Consider the example of a manufacturing company that works collaboratively on product launch plans stored in SharePoint Online with their PR agency. 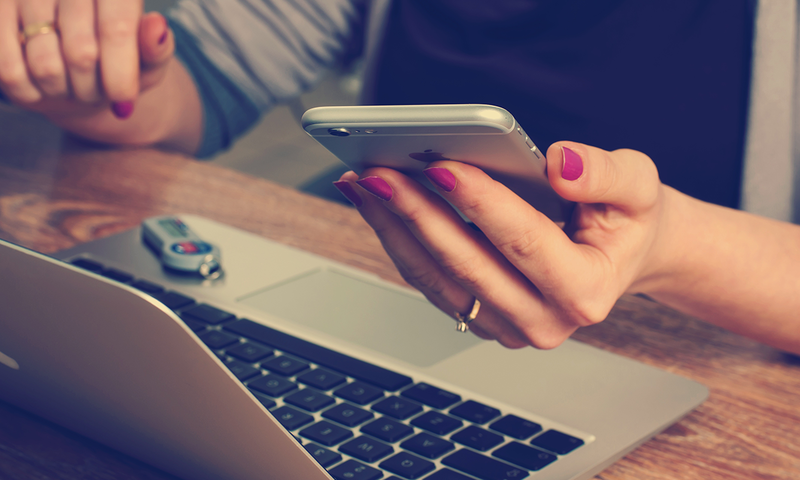 While this type of collaboration has always occurred, it now happens via cloud platforms instead of faxes, emails, and phone calls. 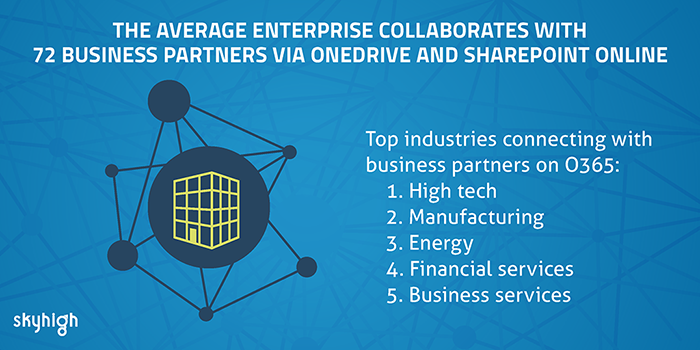 The average organization works with 72 business partners via these two applications, more than any other cloud-based collaboration platform. 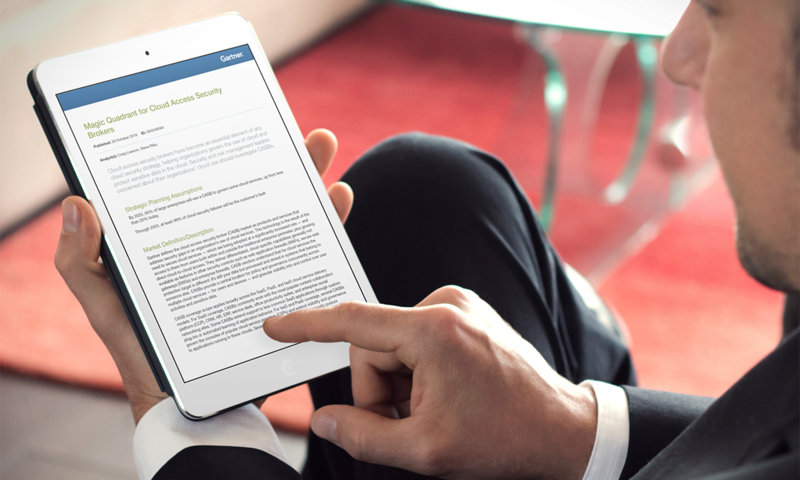 The top industries organizations connect to via Office 365 include high tech, manufacturing, energy, financial services, and business services. Microsoft has invested heavily in security, and some have even suggested that cloud applications such as Office 365 may be even more secure than on-premise software. The reason is that companies like Microsoft have large, sophisticated security teams that spend time working to prevent intrusions to their cloud applications. That’s a good thing, considering that the average company uploads 1.37 TB of data to Yammer, SharePoint Online, and OneDrive each month. However, certain types of sensitive or regulated data should not be uploaded to the cloud or shared within cloud applications to third parties, and a surprising amount of this sensitive data has been uploaded to Microsoft’s signature productivity suite. While companies have deployed data loss prevention tools to protect their data in Exchange and SharePoint on premises, many have lagged in extending those policies to their data in the cloud. Skyhigh analyzed data stored in OneDrive and SharePoint Online and found that 17.4% of documents contain sensitive data. 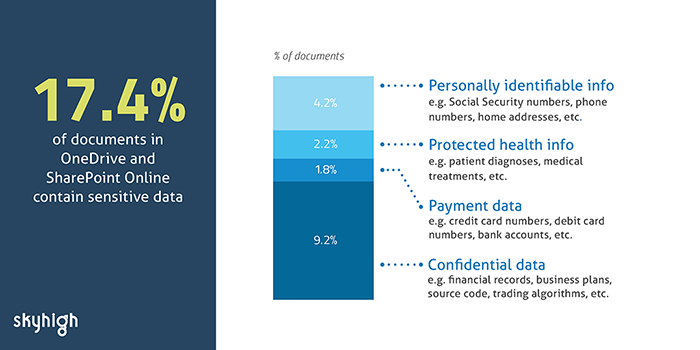 Broken down by data type, 4.2% of files contain sensitive personal information, 2.2% contain protected health information, 1.8% contain bank accounts and card numbers, and 9.2% contain confidential data. 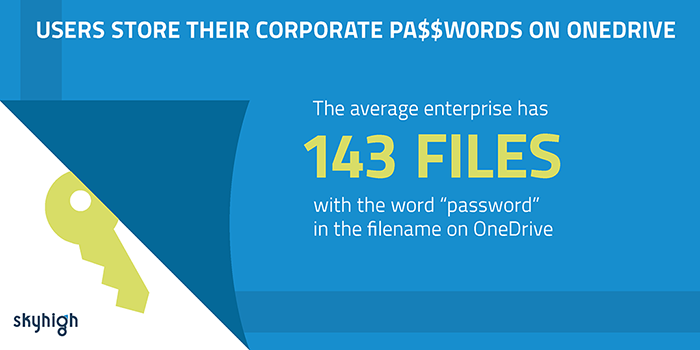 The average company also has a shocking 143 files on OneDrive that contain the word “password” in the filename (not surprisingly, security experts recommend against storing your passwords in an unencrypted word document or spreadsheet called passwords.xlsx). 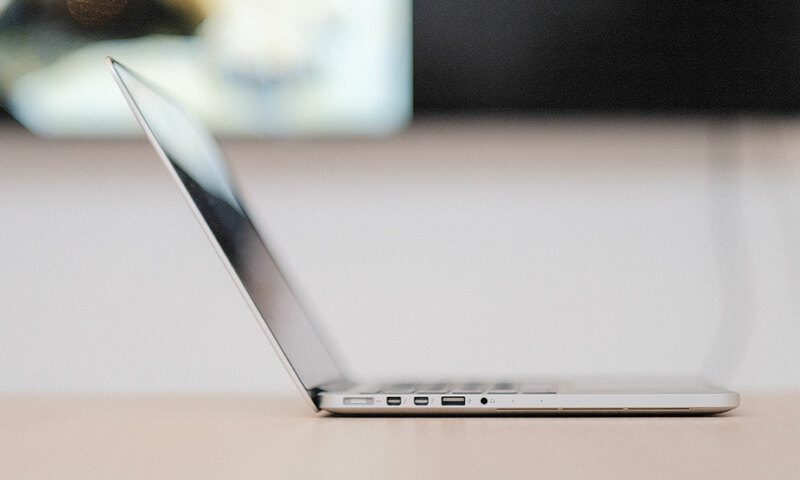 When we looked deeper at the user counts within companies, we found something surprising. Most organizations have started moving to Office 365, but they are migrating in stages rather than moving all users to the cloud at once. 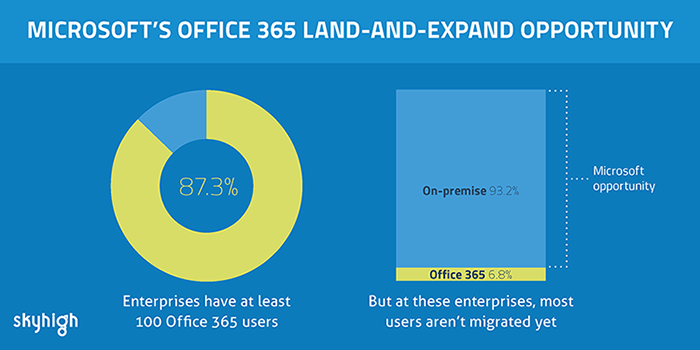 At the average organization, just 6.8% of users have migrated to Office 365. This adoption curve is consistent with what IT experts are recommending. First, companies adopt Office 365 for a department or line of business, and these users co-exist with other employees using on-premise Exchange, SharePoint, and Windows file servers. This way, the company can incrementally develop its expertise in managing cloud environments and work out any rough edges before migrating the entire company. The adoption numbers for Office 365 also reveal a tremendous opportunity for organizations and for Microsoft. As Microsoft customers continue to migrate the remaining 93.2% of their users still on legacy on-premise Microsoft products, they’ll experience greater cost savings from no longer running these applications on their own hardware. They’ll also see the productivity improvements as employees have access to improved collaboration with each other and with business partners from any Internet-connected device, anywhere in the world. And as Microsoft migrates its massive installed base to its cloud platforms, it will also see increased revenue. It’s a win-win for Microsoft and its customers.